The DNA / RNA Synthesizer OligoMaker X12 is a flexible 12-channel oligonucleotide synthesizer with 6 base positions.Can easily be upgraded to 15 base positions. OligoMaker X12 is compact (80cm x 35cm x 35cm) and easy to operate. 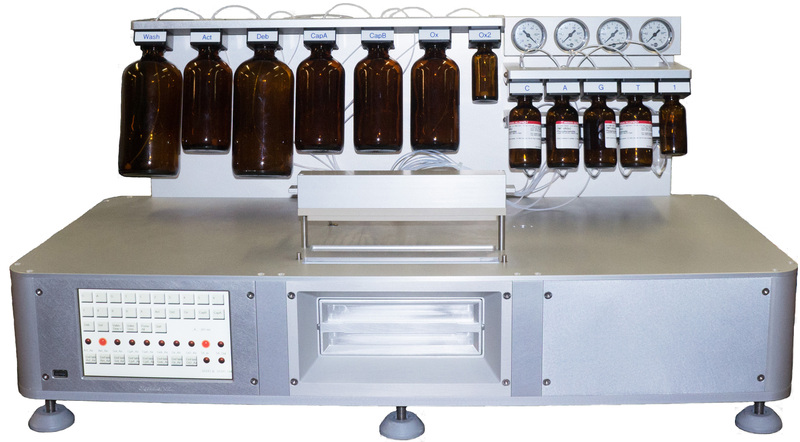 OligoMaker X12 can synthesize up to 12 oligos (20-mer) within 1 hour. OligoMaker X12 is suitable for the smaller labs at the universities, where you might have a limited amount of amidite solution. Bigger oligo houses can also benefit from this small and flexible synthesizer among all the high throughput machines. Direct injection of reagent from the valve into the synthesis column. It is possible to collect deblock reagents and check the couplings yield.